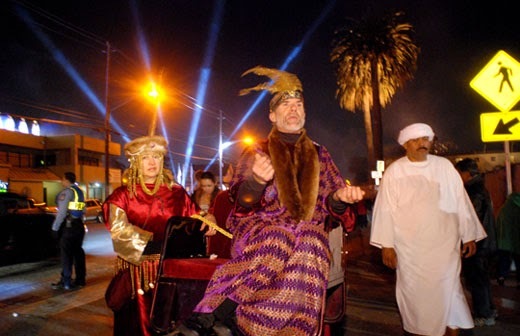 Bethlehem AD 2013 is a recreation of the town of Bethlehem as it might have appeared in biblical times. It had been on my "to do" list for a few years, and this time I was able to squeeze the last presentation of the year into my schedule. My goal, as always, was to try to summarize the entire event with a single photo. Digression: When I was studying photography at the local community college, I read a book on the use of the 35mm camera for black and white available light photojournalism. I clearly remember the author’s basic kit: Two Leica M bodies, along with a 35mm and an 80mm lens. This minimalist approach to equipment stuck with me. Today, these absolute focal lengths were no longer sovereign, since the APS (or half frame) sized sensors of most current DSLRs would require respective focal lengths of approximately 24mm and 50mm, if the proportions were to be maintained. I carried spare batteries, spare SD cards, a P7700 in place of a second body, and a 24-70 2.8 Tamron to be used only in an absolute emergency. Sneaking In: I had heard incredible stories about the long lines and the nearly impossible parking situation. Fearing the worst, I arrived at the facility two hours before the opening and parked two blocks away on Main Street. Really! That's where I parked. I walked over to the entrance and spoke briefly with some of the staff members. After chatting, I returned to my car to get my gear. When I returned, I circled around the back lot, trying to get a sense of the event. I found an open back gate and saw that a pen had been built to hold some period appropriate domestic animals. Besides goats and pigs, three regal looking camels walked about, obviously familiar with humans, and the treats they often carried. 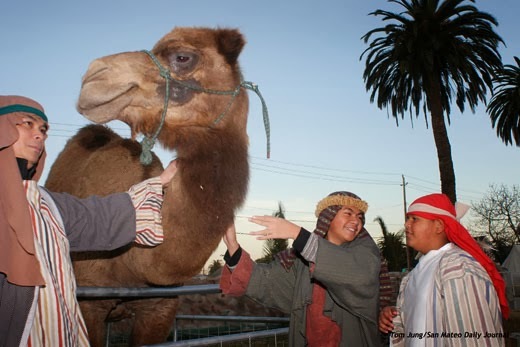 A family in period costumes made friends with the camels, so I started making photos. Photo #2 was done with the flash on-camera, with the Nikon diffusion dome in place. The flash head was set at a 45 degree angle to feather the light away from the lower edge of the frame. Photo #3 was taken a little later. For this shot, the built-in flash served as a commander set to -2 stops. My SB-800 was the main light which I held overhead. The sky was darkened a bit, turning magenta at the horizon all by itself. Another version of the same setup can be seen in Photo #4. 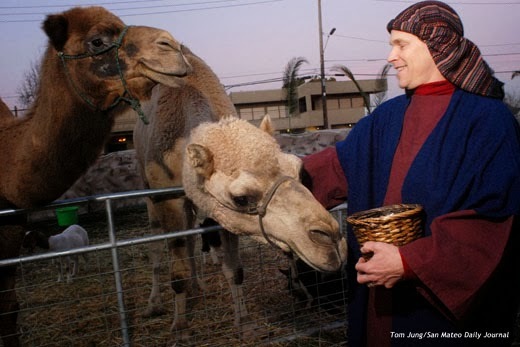 I liked this photo because it would be easy to suggest that Charlie the camel was sniffing for treats. As it turned out, I didn't submit either of these two shots for the simple reason that Photo #2 had two smiling kids, which helped to carry the message of "kid friendly event". 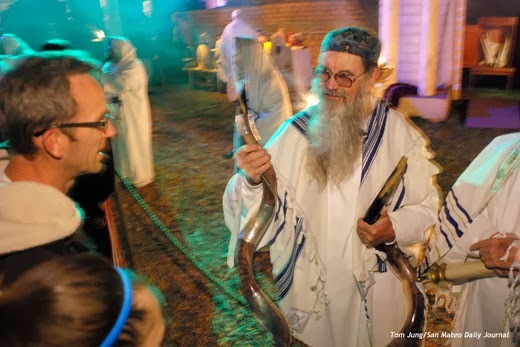 In Photo #4, a "Rabbi" was calling his congregation to the Tabernacle using bugles made from the horns of an African Kudu. The green "glow" was provided by a gelled spotlight coming from behind the subject, and the low shutter speed (1/6 of a second, F 2.8, ISO 1600) gave some edge blur on the beard, but the face is stopped by the short burst of light provided by the on-camera flash. For this shot, the white balance was "Tungsten" and the shoe-mounted flash fitted with a CTO gel to give the ambient light a cool cast. I might add that this was the most successful application of "dragging shutter" I did all evening. I loved the lighting, but the shot doesn't carry much of a story. I was getting ready to leave when I saw a procession just outside the entrance gate. 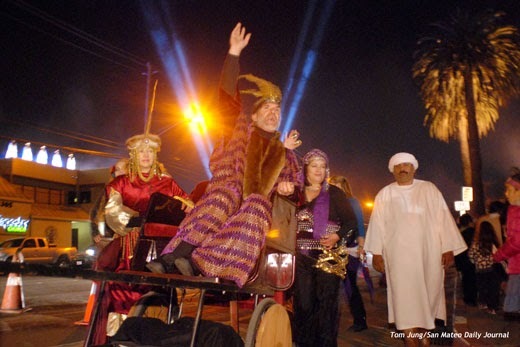 It was the persona of King Harod "berating" those waiting their turn in Bethlehem (Photo #5). Nothing special so far as my equipment and technique. My flash was camera mounted with the diffusion dome in place. The exposure, typical of the settings I used this evening, included a shutter speed of 1/10 of a second, an ISO of 1600, and an aperture setting of 2.8, wide open for the lens. The ambient light included blue rotating spotlights in the background and the headlights from passing cars, an odd juxtaposition of the old and the new. I was careful to align my shooting position with the blue streaks from the spotlights, so I was moving constantly. My final choice shown below, is also the lead photo for the post. This last shot shows has a bit more action, and it was the photo I submitted. One Body, One Lens? Perhaps. The 20 2.8 Nikor is extremely compact, and the D80 body light in weight. But I found the prime (non-zoom) 20mm lens a bit too narrow for my taste. Focusing speed was a bit of a problem when shooting at night, although I don't know if any other lens would have been significantly better. For the most part, the 20mm lens was long enough. So how about an 18mm 1.8 lens? Such a lens does exist at the short end of the Sigma 18-35mm 1.8 zoom lens. While limited to an APS sized sensor, it could prove just the ticket for photographing under similar circumstances. I don't doubt that most assignments could be completed with the two prime lenses I mentioned, but there are going to be problems at the short end. Trying to get enough a wide enough view in a crowded Bethlehem was a problem when working up close. My old standby, the 11-16mm Tokina still reigns supreme in these close quarters.